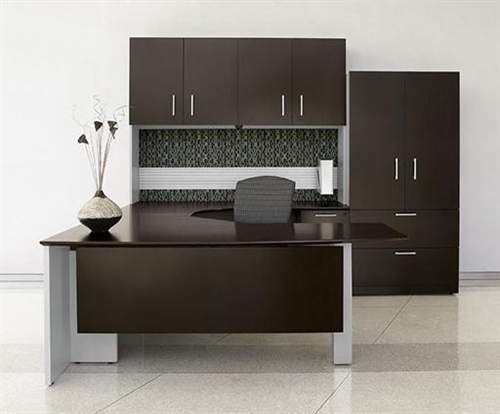 When it comes to business furniture, keeping up with the latest trends can be costly. However, these awesome new products for the conference room will improve your meeting efficiency without breaking your budget. From lecterns to modern tables, you'll love these hot new products! First up, the B44LEC lectern. 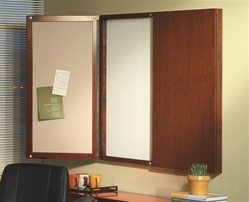 This cool modern product from Global Total Office is an excellent way to enhance your space. 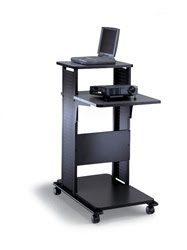 This unit is mobilized for ease of movement and features an angled stand for holding important notes while presenting. The integrated pencil ledge is a nice bonus feature that really comes in handy. Priced at $315.99, these office lecterns should be a staple in any contemporary conference room where productivity and style are important. Another awesome conference room product that should be a permanent fixture in your boardroom is the B5672FPB. 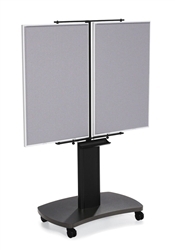 This modern presentation board conveniently matches the B44LEC lectern above and can be purchased as a package deal for added savings. Quite honestly the two look fantastic together and provide a truly cohesive and modern look to any space. The B5672FPB is available in 10 laminate finishes and boasts a durable mobile design. The ease of mobility and overall versatility of this product make it one of the hottest items on the market in 2013. 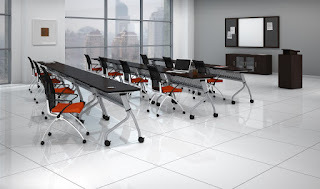 When it comes to modern conference room furniture, perhaps no brand offers a wider selection of products than Mayline. 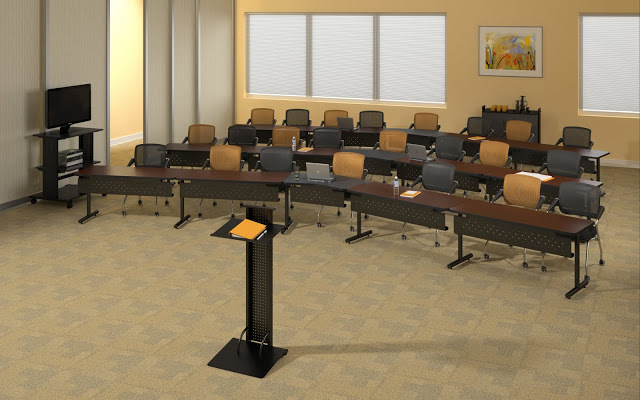 The 1010PC presentation stand for example offers an all in one package to a variety of virtual meeting needs. 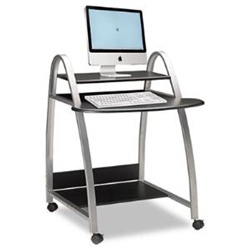 The stand is designed to support laptops, overhead projectors, and LCD projectors effectively. The front projector surface adjusts across 3 positions in 4" increments. The neutral black finish with anthracite surface ensure a matching look with nearly any decor. Priced at $265.99 this product is an excellent value and will surely improve your next meeting or presentation. Next up, the super stylish and incredibly popular Verde conference table. This hot item from the Cherryman Industries Furniture brand is truly a hot ticket item. Available in 2 unique finishes, the Verde office table creates a modern atmosphere in any room it accompanies. The white glass painted leg inserts accent the overall table them to perfection. With three sizes available, the Verde table is perfect for nearly any sized boardroom. 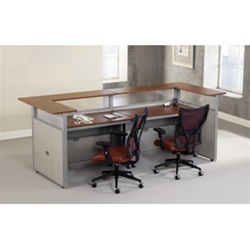 This typically stock product ships quickly for those in need of discount office furniture in a hurry. When it comes to modern conference tables, look to the Verde furniture collection by Cherryman. You'll definitely be impressed! Your conference room will not be complete without quality seating. That being said it was absolutely essential to include one of the top new conference room chairs on the market for this article's last item. The 11790B office chair by Offices To Go boasts an incredible amount of style and comfort. This multi functional swivel chair offers a breathable back and attention grabbing chrome frame that's sure to garner a multitude of positive compliments. Priced at $185.99 these modern conference room seating solutions are available with bulk discounts and include a variety of top ergonomic attributes for added versatility. Features like pneumatic seat height adjustment, a knee tilt mechanism, and twin wheel carpet casters ensure a long life of quality and comfort. In the long run, there is no limit to the amount of cool products you can utilize in the conference room. This versatile space can be designed with any style as long as it's built for efficiency! 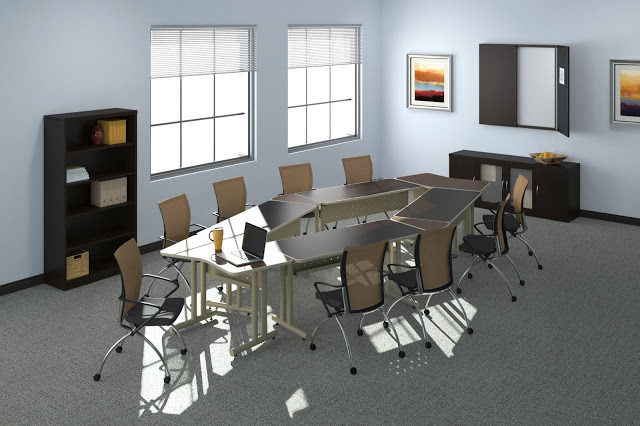 Additional products like modern wall cabinets and even modular office tables are definitely worth considering for those creating a new conference room from scratch. 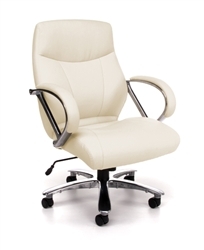 For the modern executive, sitting comfortably is absolutely essential. However, these higher ups didn't reach their positions by spending frivolously. Finding a bargain is important regardless of your social status and these 5 executive chairs provide just that. Enjoy these discount seating solutions all priced under $200 from the top chair manufacturers today. Finding a comfortable chair is never a hard task when you're familiar with brands like Offices To Go. This discount office seating provider offers a host of top chair styles adored by industry professionals and consumers alike. From ergonomic desk chairs to high end leather conference chairs, OTG boasts an awesome reputation consisting of affordable quality. The 11692B adjustable mesh chair is an excellent example of their craftsmanship at work. This super cool chair is priced to sell at $169.99. The leather accents and breathable mesh back are just a few of the awesome features offered by the 11692B. Needless to say, this product was a no brainer for this article! Another top seating solution by Offices To Go that couldn't be left out is the 11730B. 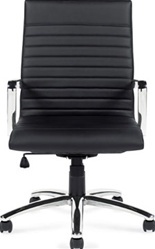 This modern executive chair features a chrome frame and segmented leather upholstery. The contemporary look of this swivel chair has made it a top seller to start 2013. Look for the 11730B in many applications far beyond the executive office. This versatile chair makes a perfect addition to the conference room as well. Priced at $199.99 this product is at the top of our budget, but well worth it. The ergonomic benefits, style, and value of this great item make it an absolute winner. Global Total Office is definitely one of the biggest and most reputable names in the seating game. 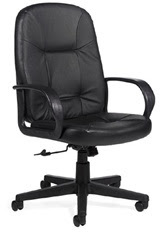 This industry leader prides themselves on providing the perfect office chair for any application. Wether your needs are modern or traditional, Global offers a product sure to keep you comfortable and working efficiently all day. This much is guaranteed. In 2013 they've released a wide variety of modern chairs to go with the industries hottest new trends. However, one Global chair has stool the test of time in terms of durability, comfort, and style. 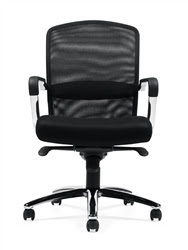 The Arno executive chair is definitely worth a look by those in the market for a simplistic chair that's all business. Priced at $192.99, the Arno chair is available in 12 leather options to match the decor of any space. The loop arm design and adjustment capabilities of this chair make it not only comfortable but effective all day. Rest assured, Arno will be making a lasting impression for years to come. Keeping it classy in the workplace doesn't have to cost a fortune. This is especially true for those who've taken advantage of the $158.99 price tag of this OFM executive chair. A long time manufacturer of discount office furniture and stylish chair, OFM is always a top solution for any office environment. The 507-LX model chair offers a high back design that's sure to impress. The luxury look accompanied by the everyday low price makes for the perfect combination of success. Ergonomic features like the instant seat height adjustment and tilt tension control add to the value of this already stellar chair. The versatile features and durable leatherette upholstery ensure good looks and comfort for years to come. Last but not least, a chair perfect for those in love with the modern look. Flash Furniture brand office seating is probably the most affordable product for available for the executive office. With chairs starting as low as $75 it's no wonder why this awesome brand has so many hit models on the market today. Chairs like this one offer the contemporary look and ergonomic features desired by today's executives at a price that can be appreciated by any budget. 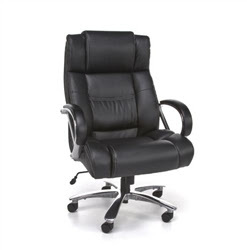 Priced at $152.99, these leather executive chairs are flying off the shelf. Attributes like the chrome frame are simply unheard of at this price point. Get yours before their gone and enjoy the benefits of a chair that should be priced nearly three times as much. Regardless of what office chair you choose it's important to remember a few simple tips. The first is to stay within in your budget. Set a price range for your purchase and stick to it! Secondly, find a solution that works best for you. Meet with dealer or visit a showroom to discuss the benefits of ergonomics in the workplace. Utilize the features that will most improve your day to day efficiency in order to be the most productive while working. Lastly, choose a style that will compliment your executive furniture. If your office features modern desking, utilize a chair with the same attributes to enhance your current decor. Other popular seating manufacturers to consider not listed in today's article include Mayline office seating solutions and even RFM Preferred Seating. As a final point, make sure to shop around. With deals like these, savings are never too far away! As an industry leading furniture manufacturer, Mayline produces a wide variety of quality training room furniture solutions. With so many awesome solutions to choose from, this article highlights the features and benefits of each collection, in order to help consumers make and educated and informed purchasing decision. This collection is an oldie but a goodie! 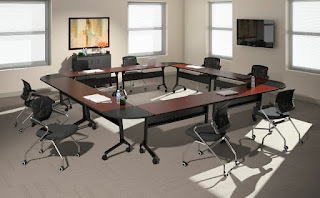 Meeting plus tables provide a simplistic approach to training room furniture. These versatile tables also work quite well in classroom, library, and other learning atmospheres. 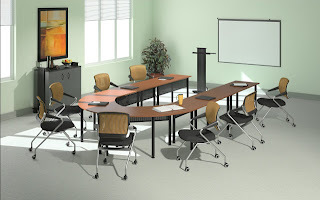 Meeting plus training table solutions are available in a wide variety of shapes and sizes. The updated design is built with durability and configurability in mind. Some of this collections best features include modesty panels with extra wide cable troughs, ganging capabilities, and optional power modules for technology intensive environments. 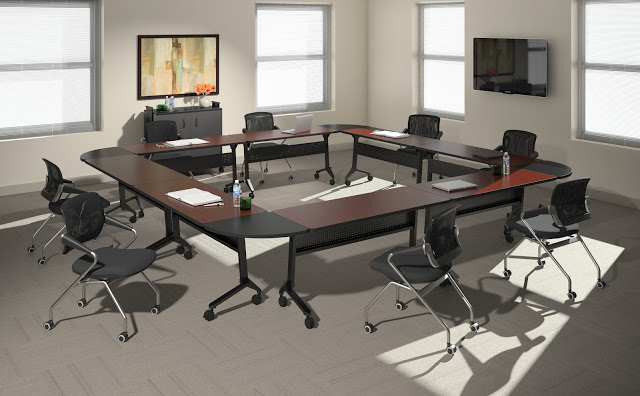 Meeting plus office tables are available in finishes that match the Aberdeen casegoods furniture collection and can be purchased on the Kwik-Ship delivery program for furnishing needs in a hurry. Get your training room in Sync! All jokes aside this collection is well deserving of it's name. Sync training table models feature a single handed center control mechanism for a convenient flip of the top. Tables are easily nested for compact storage and minimal assembly is required. Sync tables also offer an integrated modesty panel and include a ganging kit for easy linking of tables at no additional charge. Sync training area tables from Mayline provide awesome value. Available in two stunning in stock finishes the modern style and design of these tables really stands out. It's safe to say that Sync gets the job done flawlessly and looks good while doing it! Mayline Flip-N-Go tables are hard to beat. This easy to use product is an excellent solution for much more than just your training room. Commonly, Flip-N-Go table models are used cohesively to form modular conference table layouts in multi-use meeting areas and boardroom alike. Tables feature minimal assembly and an attractive black frame finish. Tables nest easily for compact storage and include locking casters as well as a built in cable trough for simplified linking. Stock finish combinations are available along with a choice of low or high pressure laminate surfaces. As with all Mayline training room tables, Flip-N-Go models will garner a host of compliments from visitors while promoting an efficient and professional work space. Encounter tables boast a clean and refined appearance and budget friendly prices. The Scratch resistant melamine surface, heavy gauge steel frame construction, and solid stance make it a top choice for any stationary learning space. These fixed leg training tables come standard with ganging hardware and leveling glides for a perfect fit. 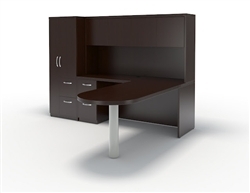 Using Mayline Encounter table solutions will surely enhance your work environment in a hurry. These unique modern office table solutions are truly here to stay! To wrap up this article on training room furniture collections by Mayline, highlighting a classic line was only proper! The T-Mate table line is a collection that's truly stood the test of time. These fully functional office products are built to last and here to stay. The Shared leg design saves cost and provides ample knee space. This revolutionary concept is what put T-Mate on the map. Available with or without modesty panels, these popular training room tables are available in two standard finish combinations and include free nationwide shipping. An excellent value for any business, it's hard to pass on the good looks and quality of T-Mate products. Creating a professional visitors area to be proud of is a priority for any business. This area is typically the first seen by guests and determines a lot about your business. For the start of 2013, several industry leading reception desk solutions have been discounted incredibly. That being said this article highlights several of the top models your business should consider if in need. If you're looking to create a cool guest reception area for your business, the Mira collection is definitely an excellent place to start. This high quality desk features a simplistic style that's easy to appreciate. Available with a wide variety of matching furniture solutions the Mira reception station is a wise and professional choice for traditionally styled visitor areas on a budget. Standard and stocked in 2 finishes. 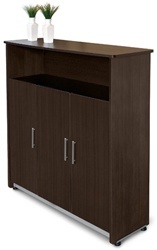 The MRSRBB station also offers 2 versatile box box file desk pedestals for added storage. Finding affordable office furniture for your business is simple when you know about manufacturers like OFM, Inc. 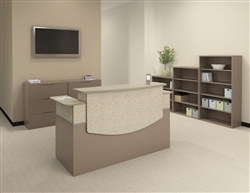 This industry leading brand provides a host of curved reception desk styles that have dominated the market for the past 2 years. Marque stations are available in three popular finishes and feature the modern style desired by most. The cutting edge look of this curved station is hard to miss. Marque stations look awesome next to OFM beam seating solutions from the Stars, Net, and Moon seating collections. Cherryman Industries furniture is a top choice of interior designers and consumers alike. Their modular casegoods furniture is some of the absolute best around. When it comes to discount conference tables they are no slouch! Quality and craftsmanship are easy to see with a brand like Cherryman and for that reason they are an easy choice for this article. The most popular of all available Cherryman furniture collections, the Verde series has taken over the modern furniture market. This modern reception desk is available in two coffee inspired finishes and includes free nationwide shipping. 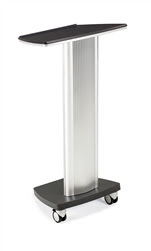 Overall, the VL-644L station is an absolute value at only $1509.99. Creating a reception space that works is often about the type of business and image your are looking to highlight. The CSII Reception desk is a fine piece of furniture from Mayline that highlights commercial style and appeals to an industrial crowd. This two tone station is a made to order piece and will take a bit longer to get to you. For those in a hurry, this might not be the choice for you. However, if you can wait the necessary manufacturing time, this desk is truly awesome. The one of a kind look and color combinations available make the CSII reception desk an excellent value and definitely worth the wait. Another popular line of OFM office furniture, the Rize series features a panel furniture inspired style that's super easy to assemble and re configure. Units like this 2 person reception desk are an excellent example of OFM's quality craftsmanship and cool products! This unit is available in two finishes and matches the rest of Rize office cubicles for your modular business furniture needs. Starting the year off with a bang, several key seating manufacturers have released some awesome new chairs to the market. Manufacturers like Mayline, Global, and OFM, Inc. are offering models that are currently skyrocketing in popularity. This article will highlight several of January's top seating solutions for both home and business needs. This revolutionary seating solution by Mayline is a top choice for highly active work environments. The durability and comfort of Commute seating is hard to beat. Available in a variety of styles, Commute chairs are customizable for those who prefer mesh or fully upholstered seating. Ergonomic features are not at a shortage when it comes to the Commute office chair. Attributes like adjustable arms, seat height adjustment, and heavy duty casters are just a few of the benefits this great new chair has to offer. Check out a Commute chair today. You will definitely be impressed! The latest release from Global Total Office is the new Takori chair. 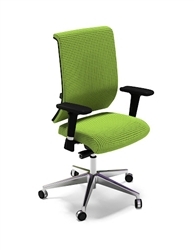 This two-tone office chair is perfect for modern work environments where style is important. Looking to enhance your space? The Takori is an excellent way to pull your work atmosphere together with contemporary flair. Available in a huge selection of fabric and leather textiles, these modern office chairs have become incredibly popular in the short time they've been available. Ergonomic features vary depending on the model you choose. In a nut shell, this chair can be configured to meet almost any individual need and looks great doing it! 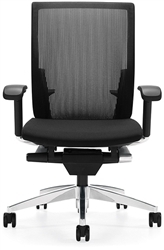 When it comes to Big and Tall Office Chairs, products by OFM, Inc. are hard to beat. This top office furniture and seating manufacturer has long provided industry leading solutions for nearly every room of a business. From modular conference tables to stylish beam seating, OFM, Inc. is always a popular choice by designers and consumers alike. That being said, the new Avenger chair has become a hot commodity over the course of this month. With two models available, OFM has created a luxury big and tall chair that boasts class and elegance by the ton. Excellent ergonomic features and a choice of two leather options make this chair a big winner in the month of January. Another product from Global Total Office, the G20 chair! This awesome seating solution was an easy selection for this article. If you're looking to improve workplace comfort and support, there's no better option. The mesh back design keeps you fully functional all day long. The durability, style, and affordable price of the G20 are all what you'd expect from a manufacturer as well known and respected as Global. From discount conference tables to affordable executive desks and business seating, Global has truly made there mark in 2013. Last but not least, the Valore chair. As with most office seating from Mayline, the Valore seating is definitely an excellent value. Priced at only $376.99, this two pack of folding office chairs is perfect for computer furniture and training room furniture applications. While most of the new office chairs highlighted in this article are designed for office desking use, the Valore is a Jack of all trades. This versatile seating solution is built to last, available in three stocked colors, and boasts modern style for days. 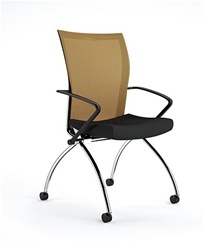 Check out this chair today and see why the entire industry is buzzing about Valore! Organization is a major concern for any business. Part of keeping any office efficient and productive requires organization and professional products to help accomplish this. This article highlights a variety of stylish office products sure to accomplish just that! These space saving and effective office storage products are an excellent way to say time and money at work while keeping your business operating smoothly. 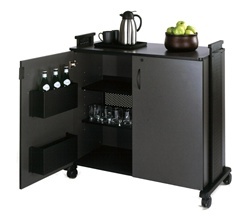 Most all conference, training, and meeting areas feature a beverage cart of some sort. This professional solution to that need is affordable and stylish! The 1015HC cart is quite affordable at $418.99 and is built extremely well. 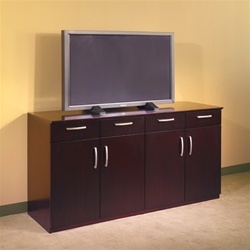 This model comes standard with two adjustable shelves. Locking casters provide easy mobility. The left-side door has two perforated steel storage pockets sized perfectly for 2 liter bottles. Doors have self-closing cabinet hinges, attractive door pull, and standard lock. The handle provided on both left and right legs at a comfortable operating height. The 1015HC is easy to assemble using quarter-turn cam fasteners. Continuing on, the Mayline 995 bookcase is the perfect solution to your modern office needs. 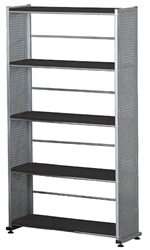 Available in two finishes, this cool storage product features perforated steel uprights with thermofoil shelves standard with 5 fixed shelves. It's easy to see and appreciate the industrially influenced style and quality manufacturing of these modern bookcases. Most industry dealers and consumers familiar with Mayline furnishings will tell you, their products are truly tops. The 995 bookcase is a perfect example of that! Now this is a cool product! The Global Total Office Stage Coach Pedestal is a versatile piece of modern office furniture geared towards efficiency. 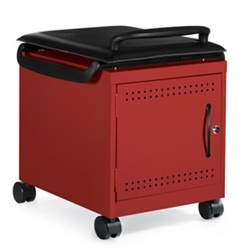 The ESC-19HDL is available in 5 cool paint colors and offers temporary guest seating for any file room. 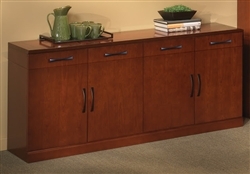 The lower storage cabinet is a great way to transport files and locks for security. The durable casters make for smooth movements and the padded cushion is actually quite comfortable. This is a must have office product for any business! Creating a stylish executive workspace is a must for any office higher up. Visitors need to feel welcome and impressed with the look and style of their environment. In fact, studies have shown that first impressions of a business are often formed from the decor. 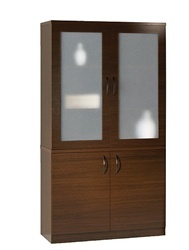 No need to worry, with products like the Venice cabinet by OFM, Inc. your space can have luxury appeal on a budget. 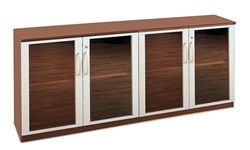 OFM executive wall cabinets like the 55116 offer a choice of Cherry and Walnut finishes. The modern style is easy to spot and the quality craftsmanship is easy to appreciate. Store your files in style with its contemporary design and gorgeous thermofused melamine construction. This unit includes upper open compartment and lower closed compartments. No tools are required for assembly, so you save on installation costs as well. What a value! How about three products in one! Perhaps no manufacturer is more innovative when it comes to office storage products than Global Total Office. If you're looking for ways to stay organized at work this metal storage cabinet offers ample flexibility and space saving features to any office it accompanies. Personal storage cabinet solutions like this one offer three separate compartments, keyed alike to lock for additional privacy and security. The 24" deep ventilated, full height wardrobe section accommodates long coats and jackets with a separate lock for added security. Another awesome feature of these is the ventilated locker compartment with two shelves suitable for personal items and 3-ring binders (three shelf units are also available). Still not impressed? 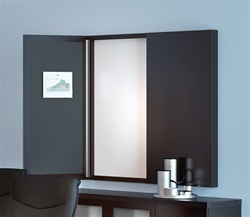 This unit also offers a separate filing section for your important documents that also locks! Wow, all this in one isolated stand alone piece of office furniture for only $947.99. Now that's a value! With so many furniture manufacturers available, it's hard to know which brand to choose. This article will shed some light on the subject and highlight several of the top furniture manufacturers for 2013. These awesome brands include Flash Furniture, Global Total Office, Mayline, Cherryman Industries, and OFM, Inc. Regardless of your home and business needs, these great companies have the products to keep you working in style and within budget. Flash furniture is a relative new comer to the seating industry. That being said that have made a huge impression in their short tenure. 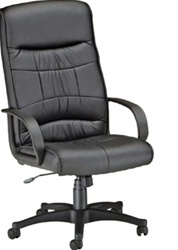 Their variety of affordable office chairs is simply unmatched. Interior designers and top furniture sales companies love Flash as they really understand the needs of the consumer. This popular seating corporation offers a seemingly limitless selection of mesh chairs and discount executive seating to meet the needs of any space. In addition to chairs, Flash Furniture provides tables, recliners, and a host of other great products that ship quickly. For those looking for products in a hurry, find a dealer selling Flash products! Global Total Office has been a reputable industry name for years. Their ergonomic office seating solutions are some of the most advanced and user friendly on the market. Products like the new G20 mesh chair and Zira desking collection have already been a huge in January. Along with seating and desking, Global Total Office provides a host of modern conference table solutions to meet the needs of any boardroom. Their customizable tables are available in a huge selection of finishes and surface shapes. Metal legs and contemporary style are easy to appreciate with these awesome office tables. Additionally, Global provides a host of GSA approved office furniture and seating for government entities. Looking for green and sustainable products? No problem, Global is a manufacturer that truly cares about our carbon footprint and takes the necessary time to have products thoroughly tested to the highest eco friendly standards. A long time favorite of almost and business furniture provider, Mayline has rapidly become a household name for any reputable business. This industry leader has introduced a plethora of great products for the new year. Some of these include the new ergonomic commute chair and the ever popular e5 open desking collection. These easy to spec solutions offer comfort and efficiency improving features simply unmatched by other products at the same price point. Mayline furniture will undoubtedly start and end this year as one of the absolute best brands available. The quality craftsmanship of all their conference tables and training room tables is hard to beat. They are THE name is filing and storage products and truly set the bar when it comes to small home computer desks for educational and learning environments. Needless to say, Mayline rocks! If you like quality executive office desks, you'll love Cherryman Industries in 2013. This casegoods furniture specialist makes there mark year after year in the desking community with top lines like Verde, Emerald, and Jade series desking. An old favorite of dealers that seems to be regaining industry steam is the Cherryman Amber furniture collection. This line of revamped desks and reception furniture really pops in the workplace. Cherryman brand products typically ship within 48 hours. A nice benefit for those on a time crunch! Last but certainly not least, OFM, Inc. furniture and seating. While most of the manufacturers listed in this article specialize in one area. OFM, Inc. never settles and has made incredible strides in both the furniture and seating industries. 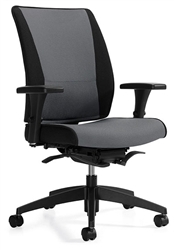 As for seating, products like the new big and tall Avenger office chair are taking over in a hurry. This incredibly popular chair boasts a wide range of ergo friendly features and a consumer friendly price tag. Avenger office chair models are available in a choice of black or cream leather upholstery and offer a true taste of luxury in the workplace. 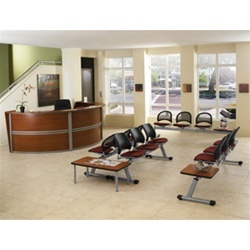 In addition to to seating, OFM furniture like the ever popular Marque series curved reception desk models have become the number one selling reception station online. The new glass conference table models offer a super cool alternative to traditional wood veneer conference tables and bring and boardroom to life. Look for OFM, Inc. to be a major player in the contemporary office furniture manufacturing game in 2013. Dealers will be scrambling to stock their entire line of incredible products!